THE entire first floor of the Nitze Building was cleared Saturday evening for the marquee event that captures the mosaic of SAIS students — the annual SAIS International Dinner. Hosted by the Student Government Association and the Office of Student Life, the three-hour event showcased an international food expo, a lively stage of head-turning performances, a well-stocked bar, a gift shop for SAIS apparel and canned food drives for SAIS Corps and Veterans Club. Guests piled into the line around 6 p.m. to purchase their tickets for the worldly delights that awaited them in the Nitze cafeteria. Roughly 500 two-dollar tickets were sold to around 250 guests. Each ticket earned one tapas-style serving from any of the dozens of student-run tables serving food from all over the world — from Brazil and Ecuador to Zimbabwe, from Germany and Sweden to India, China, and Indonesia; food was aplenty. Clubs were allocated $150 to cook at least fifty servings and to ensure sufficient portions. For foodies and non-foodies alike, it was hard not to act like a food connoisseur. Some filled up on Swedish meatballs, German potato pancakes and Japanese tempura rolls, while others had Indonesian satay, pad thai, or Kenyan “chapati” dough and “ndengu” beans. There also was Greek spanakopita, Taiwanese bubble tea, Korean kimchi and Nigerian spinach stew. One could also find Italian pasta al pesto, Canadian pumpkin muffins, Ecuadorian ceviche and Chinese huaiyang fried shrimp rice. 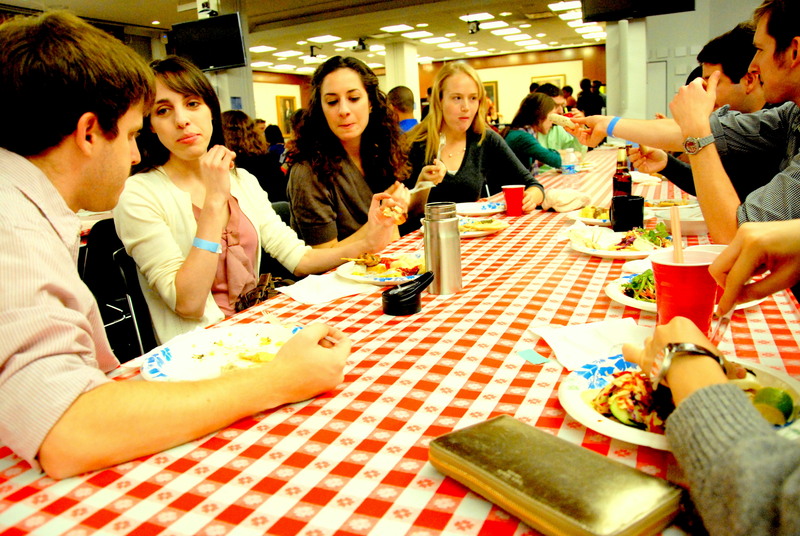 In all, twelve SGA-designated clubs prepared food in addition to other student groups, associations and volunteers. After the guests were satiated with endless sampling, the evening transitioned into a series of lively student performances. Second-year students Felix Amrhein and Karin Riechenberg commenced the lineup with a salsa performance, which was followed by a crowd-pleasing Zumba dance by second-year students Aichida Ul-Aflaha and Marco Sanchez Junco. The Chai Club then took the stage in color and South Asian traditional attire, dancing to an energetic mix of Bollywood songs. Next was a trio Cuban Casino performance by Karin Riechenberg, Rebecca Freeman and another dancer. Director of Student Life Lisa Kahn, Assistant Dean for Student Life Dean Wilson, and Associate Dean for Development Lori Cwalina then took the stage as judges for the best dishes, sampling food from every club. After an hour of tasting and filling up, the judges convened offstage to deliberate their favorites while three individual performances entertained the packed auditorium. First-year student Oleg Shakirov delivered an animated Russian rap song in front of a music video with English subtitles, finishing his song with the line “..shoutout to Dean Nasr for not prohibiting this performance.” First-year student Seethal Kumar then took the stage in bright colors to perform an Egyptian belly dance with veil and a drum solo. And lastly, second-year student Constance Wilhelm gave a two-song performance in French, inducing the crowd to sing and clap along. The event concluded with the announcement of winners for the food contest, which went to the Greek Club for best taste and the Taiwanese Club for best presentation.